May 22, 2018 | about NEW products .., desktop Units .., eurorack modular .., events and meetings ..
After SUPERBOOTH18 there are a lot of new things added to SchneidersLaden. Here comes a wild compilation of what we have new in the store or will have later. And this is just the tip of the iceberg, there are many more new things on our list! To begin we have GRP Synthesizers from Italy now entering the eurorack modular market. The GRP Synthesizer products are completely hand-assembled and have a characteristic GRP sound and design. 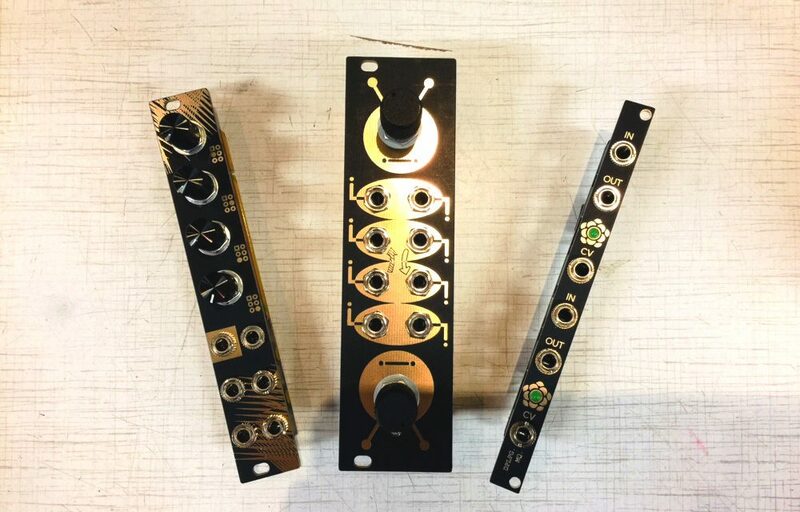 These high quality modules are already up on the website and can be pre-ordered. Sonic Potions is finally producing the versatile Malaclypse module. We already have one unit in our showroom – so come by and check it out! Create infinite variations of modulation voltages, digital noise timbres or process external audio through this creative tool. Also new at SchneidersLaden are the modules by the passionate Chinese manufacturer Meng Qi. If you have been involved with eurorack modular synthesizers you most likely have seen and heard his modules before, but you always had to order these from China. Find them now at SchneidersLaden! Follow this LINK. Have you ever heard of the company building distortion units in Portland already in the 1920’s? No? Neither have we – because no one has done that! But we know what they would have looked like – if they every came to existence: Like the units from Retro Mechanical Labs – great looking effects boxes with a strong impressive sound! Find these nice boxes of heavy sound now at SchneidersLaden. The Stargazer from Møffenzeef Mødular is a new approach on digital drone synthesis – a very aggressive sound machine. In contrast to other drone generators the Stargazer is about digital goodness than analog oscillator swarms and about unheard walls of sound. The most reduced form of a digital drone synth might be the Jarmaggeddon – another development by Møffenzeef Mødular. To add another coast to the debate there is now the North Coast Synthesis. But instead of bringing a new alternative approach of synthesis this new company brings a fresh approach to low-pass-filtering. The MSK 007 Leapfrog VCF has a totally new circuit design and sounds just massive! The guys over at Gearslutz have made a little documentary about ACL. Get some insights to the work of this module maker from Berlin. And: Hear some special sounds from their products, especially the huge sounding new VCO! Follow this LINK for the video. More News: Have you been to our new event room? In Schneiders VideoTheke workshops, concerts and presentations of manufacturers, artists and friends of SchneidersLaden will take place every Thursday. Next one is a workshop with Mutable Instruments on Thursday 24th of May. Find out more here.